Wonderful fun card with the pattern paper and the Santa design. I love the belt decor too. Great Christmas card. Love the Santa image and the belt design too. Love the Santa stamped in red! Great embellishments with the belt, the snowflake, and the pearls. 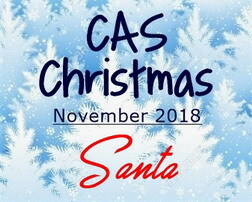 Thanks so much for joining us at CAS Christmas! Beautiful vintage Santa image, Nancy! I love it cut into an oval and placed over the black background. It really pops against the dark card. Clever and creative design with the red belt and gold buckle! Fantastic card, thanks for sharing with us at CAS Christmas! Hope all goes well for your father tomorrow! Sending good thoughts your way! 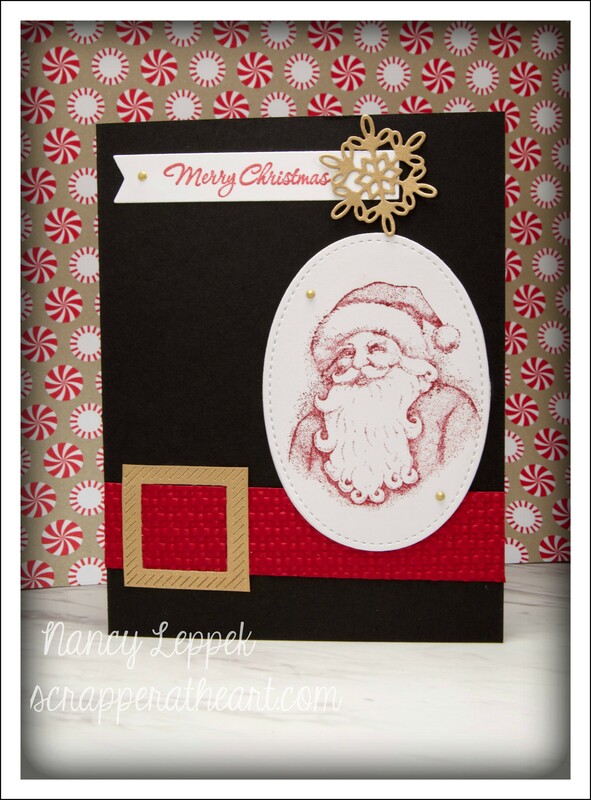 What a fabulous idea to put this traditional Santa on a black card with the Santa belt as a border. Thinking of you today and well wishes for your father. Hugs! So sorry to hear about your dad. I hope his surgery goes well. Love the traditional Santa….very sweet card. This is a beautiful Santa, Nancy! I love how you’ve paired him with the belt and how dramatic the red on black looks! I hope your dad does well in his surgery and recovery. Thanks so much for sharing with us at CAS Christmas! Nancy, such a wonderful traditional Santa and love the fact you stamped him in red. Great layout with the belt. Thanks for joining us at CAS Christmas. P.S. thinking of you and your dad during his surgery. Nancy, I love this vintage Santa too and glad you were able to make such a fabulous card with it. Hugs to you and prayers that all goes well tomorrow. Hope you have a great Thanksgiving. Thanks for joining us at CAS Christmas.